Eat Your City: Palestinian Bazaar Edmonton, AB - Palestinian cultural riches: food, art and music! Palestinian Bazaar Edmonton, AB - Palestinian cultural riches: food, art and music! Last weekend, we headed to Edmonton's first annual Palestinian Bazaar, celebrating the cultural richness of Palestinian people and helping raise awareness for Humanserve.org. Held in the Atla Arts Barn close to Whyte, we joined the crowd in looking for elusive free parking spots and headed inside out of the chilly March winds, eager to take in some cultural dances, a fashion show, artwork, shopping and of course, can't forget the food! After squelching many impulse buying opportunities at the jewelry, traditional jewelry boxes, traditional embroidery booths (amongst others), we stayed a while to watch a sand artist make gorgeous scenes with colored sand. Passionate about her art, she was giving mini lessons as to how she was able to start/stop the flow of multicolored sand. Mind you, if I attempted it, I'd probably just get a jar full of jumbled colors rather than camels, birds, orcas, mountains, ocean scenes, tranquil oasis scenes, palm trees or pretty sunsets! We noshed on this delicious traditional sweet while watching meandering through the vendors and exhibits. Hidden underneath a layer of crisp phyllo-like pastry is a soft, tender layer of nougat-like cream, cheese and orange blossom. Lightly laced with a lemon cinnamon syrup and topped with toasted pistachios.. Nom! Kunafi Naboulsi - we thought it was a pizza at first! 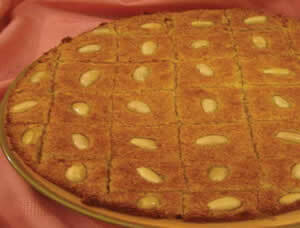 We then tried some Palestinian Ghraybeh, a rich buttery shortbread with a touch of orange blossom water and an almond in the centre, Harissa Pastries - densely sweet cake squares, moist with sugar syrup decorated with an almond. 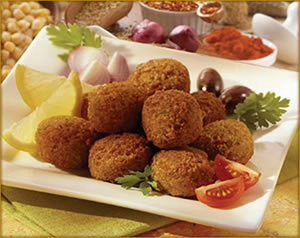 They also had falafels - ground mixture of chickpeas, spices and deep fried. Normally served with tahini sauce, grilled and pickled veges in a wrap. One of my fav vegetarian dishes when I'm not in the mood for meat. Mmm! And of course, the Kunafi Naboulsi.. soo crispy good! From clockwise top: Palestinian Ghraybeh, Harissa Pastries, Falafel and Kunafi Naboulsi.. soo crispy good! Next up was Baklawa fingers full of ground walnuts, layers of flaky phyllo pastry and liberally laced with sugar syrup from Cedar Sweets. Mmmm! And a slightly less traditional Tandoori Chicken mini stone baked pita. The chicken packed a nice hit of flavor and spices with some shredded lettuce and diced tomatoes all wrapped up in a soft tender pita. Will have to head to their actual storefront again sometime (with camera) as these stone baked pitas are awesome hot out of the oven! And finished off the afternoon with a fashion show, showcasing traditional cultural dress - intricate embroidery tells of the family's roots. Cedar trees, flowers amongst other symbols show which region, village or even family name! Embroidery on tablecloths, napkins, pillows and other household items are made by women and are sold locally and internationally as a source of income and to keep the tradition and culture alive. We had to run due to prior engagements, so until next year! We had to run due to prior engagements and missed out on the hip hop benefit concert later on in the evening. Not to leave you hanging, here are some traditional recipes until the Bazaar next year! * Tahina is a paste made from ground sesame seeds and is available at Middle Eastern stores and ethnic food sections at the supermarket. Mix the semolina, the sugar and the butter in a large bowl. Use your hands to corporate the butter with the other ingredients until mixed well. Mix the yogurt and the baking soda in a separate bowl. Wait a few minutes until the yogurt doubles in size. When the yogurt has doubled (or almost) pour the yogurt mix on top of the semolina mix. Use your hands again to mix. After you combined the two mixes, press the mix down on a small jellyroll pan or a 9x13 Pyrex baking dish. (The cake mix should not be more than 1 inch thick. If it is bake the cake in a bigger pan or take out the extra and bake it in a separate pan.). Cut a diamond or square design in the cake with a butter knife. If using almonds as a garnish, place one in each piece before baking. Bake at 400 degrees for 30min to 45 mins until it’s a bronze brown color. Pour cold syrup (see directions below) on top while its hot so it can absorb all the way through the pastry. Mix all the ingredients for the syrup and place in saucepan on high until it boils. If using citric acid use only the tip of a teaspoon. Mix all syrup ingredients in a medium pot. Bring to boil then reduce heat and leave to simmer for 10 minutes. * Kunafi dough is is available at Middle Eastern stores and ethnic food sections at the supermarket. Mix orange colour with milk and our over the dough and rub well by hand. Add melted butter and rub well by hand. In 9 inch round or 9x12 inch rectangular baking tray, put half of Kunafi dough mixture, spreading to cover the bottom and press VERY well with the palm of the hand. Make a 1 cm rim around the perimeter of the pan by pressing against the tray. * Gum arabic is the hardened sap of the acacia tree and in cooking it is used as a stabiliser. It is available at Middle Eastern stores. Mix sugar, milk, thick cream, flour, semolina flour and corn flour in a deep sauce pan. Stir well. Bring over high heat to boil then reduce heat and continue stirring till it thickens, about 5-10 minutes. Add gum arabic, orange blossom water and cheese and stir. Pour filling over the first Kunafi layer in the pan and spread all over, leaving 1cm space between the filling and the sides of tray. Arrange other half of Kunafi dough over the filling layer and press lightly. Bake on lower rack of the oven, for about 25-30 minutes or till bottom starts to be golden. Take out of the oven and immediately pour sugar syrup over the hot Kunafi layers. Sprinkle some pistachios on top. Cut and serve while hot. Beat butter, sugar, and orange blossom water thoroughly with a mixer. Add flour gradually and mix well. Form small cookies into an doughnut shape, with each cookie being about a couple inches in size, give or take. 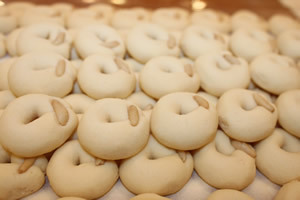 Press a blanched almond in the center of each cookie, where the ends have overlapped. Place on cookie sheets and bake at 300 degrees in a preheated oven for 20 to 25 minutes. Avoid browning.